Elkhonon Goldberg's groundbreaking The Executive Brain was a classic of scientific writing, revealing how the frontal lobes command the most human parts of the mind. 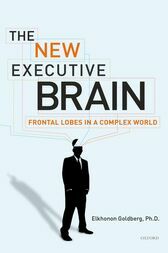 Now he offers a completely new book, providing fresh, iconoclastic ideas about the relationship between the brain and the mind.In The New Executive Brain, Goldberg paints a sweeping panorama of cutting-edge thinking in cognitive neuroscience and neuropsychology, one that ranges far beyond the frontal lobes. Drawing on the latest discoveries, and developing complex scientific ideas and relating them to real life through many fascinating case studies and anecdotes, the author explores how the brain engages in complex decision-making; how it deals with novelty and ambiguity; and how it addresses moral choices. At every step, Goldberg challenges entrenched assumptions. For example, we know that the left hemisphere of the brain is the seat of language--but Goldberg argues that language may not be the central adaptation of the left hemisphere. Apes lack language, yet many also show evidence of asymmetric hemispheric development. Goldberg also finds that a complex interaction between the frontal lobes and the amygdale--between a recently evolved and a much older part of the brain--controls emotion, as conscious thoughts meet automatic impulses. The author illustrates this observation with a personal example: the difficulty he experienced when trying to pick up a baby alligator he knew to be harmless, as his amygdala battled his effort to extend his hand.In the years since the original Executive Brain, Goldberg has remained at the front of his field, constantly challenging orthodoxy. In this revised and expanded edition, he affirms his place as one of our most creative and insightful scientists, offering lucid writing and bold, paradigm-shifting ideas. Elkhonon Goldberg, Ph.D. is Clinical Professor of Neurology, New York University School of Medicine. He was a student of the great Russian neuropsychologist Alexander Luria, and is the author of The Executive Brain and The Wisdom Paradox.